When it comes to our customers' satisfaction, we have one rule: settle for nothing but the best. That's why we are offering you this amazing cleaning tool, specially designed and tested by professionals and made with premium quality materials, in order to make your life easier. Because we know how frustrating it becomes, having to spend on a variety of cleaning tools which require money and effort for little to no results. 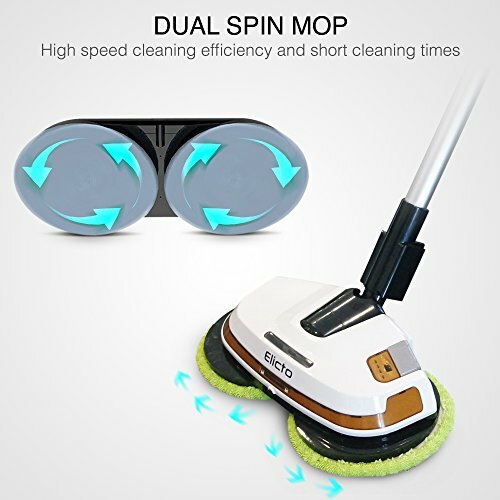 Because your health is important, and this amazing 3-in-1 electronic mop will protect your hands and back from injuries, not to mention your house will become a germ-free environment. ADD TO CART NOW and you'll instantly fall in love with this powerful cleaning tool dedicated to make your life easier! 2 AAA Batteries are required for the remote on the Handle. This Unit comes with two green pads for mopping and polishing, and 1 Dark Green pad for scrubbing. WHAT YOU NEED: Are you tired of having to use a bunch of expensive cleaning tools for all your different floor surfaces, and not even being satisfied with the result? Do you want a simpler, less tiring way of leaving your house spotless? Then you've come to the right place! MULTIPURPOSE: The Elicto ES530 isn't just a regular spinning mop. Its special design combines 3 different elements to make your floors spotless, by mopping, polishing and scrubbing at the same time. Make your floors look shiny and clean with the simple press of a button! INTERCHANGEABLE&WASHABLE PADS: Our 3-in-1 Cordless Spin Floor Cleaner for All Surfaces is equipped with 2 microfiber pads, one for each spinning head, to double the cleaning power! The pads are interchangeable and machine washable saving you the money and trouble of replacing them after each use. Just throw them in the washing machine when you've finished and you're done!